Periodic lubrication of your steering box is much, much easier than disassembling it to replace the bearings, sectors, etc. The top bearing usually goes first because on many steering boxes it is hard to get lubricant to that bearing. Some boxes have a fill port on the column above the dash, on others you have to remove the steering wheel to put grease or gear oil on the top bearing. I have even heard of some people drilling a small hole in the hollow steering tube so the top bearing can be oiled by simply removing the nut and pouring oil into the steering tube. I don't think it is a great idea to start drilling holes in things like steering shafts myself. If your tractor was like mine, the top bearing is already junk and you will have to dissassemble the box to replace the bearings. When you are finished with the repairs, use 90W gear oil, or 140W outboard motor oil, and fill it up. Some people recommend using "cornhead grease" to fill the steering box, but I'm not sure if that is a good idea for year-round use. Anything that helps keep lubricant inside is an improvement though. I also go ahead and pack the top bearing with grease. I know it is going to run dry with anything thinner, so a little axle grease may save it. It sure won't hurt anything. 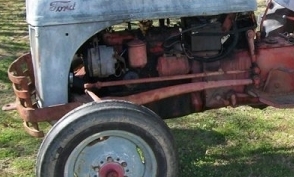 The steering box on both the early and late 8N tractors can be adjusted. However, the actual problem is more often external to the steering box and/or the wear has been allowed to progress beyond the point where adjusting the steering box will do much good. Serious problems with the steering box, that a simple adjustment cannot fix, are obvious. Noises such as grinding, popping, or squealing are beyond simple adjustments, they must be repaired. Most steering problems can be diagnosed while driving, if you know how the steering should work. Even at slow speed on relatively level ground the tractor should turn in either direction with ease and AUTOMATICALLY return to center from a turn in either direction when you release the wheel. There should be a minimum of play (not more than about 2-inches) with the wheels pointing straight ahead. This is the way it should work. I have provided a very basic trouble-shooting chart below. Hopefully, this will help point you in the most likely direction. Worn parts in several different locations often cause various combinations of these symptoms. The idea here is to make sure all the less expensive repairs to the main axle pivot, spindles, hubs, drag links, and radius rods are performed before doing any more expensive work on the steering box. REPAIR NEEDED = Bent Radius Rod(s), Alignment adjustment, and/or worn center axle pivot bushing. REPAIR NEEDED = Loose spindles, bad wheel bearings, Alignment adjustment, or flat tire (sorry couldn't stop myself). REPAIR NEEDED = Bad tie rod ends, Loose spindles, or wheel bearings. Often overlooked are the radius rods. Frequently these are bent, and will make your tractor hard to steer or very unpredictable. This is an extreme case, it's by far the worst-looking set of radius arms I've ever seen. Radius rods get bent by hitting ruts or a tree with the front tire. This bows the radius rods upward in the middle. Look at each radius rod from the side and from the top. They should be as straight as possible. If one or both of yours are bent, they can be removed and easily straightened on a shop press. If you don't have a press, they can be straightened on the tractor with a jack, scrap lumber, and a piece of heavy chain. Take care, work slow, straighten a little at a time, and use blocks of wood to spread the force and not crush or dent the hollow tubes. The radius rods have a bit of spring to them, so you will need to go a little past straight, so they come back to straight. Watch as you release the jack after each attempt, and you will see about how much they spring back. The front axle assembly pivots on a center bushing. Excessive wear at the bushing affects how the entire steering system functions. The axle assembly must be held square and secure by the center pivot bushing and two (straight) radius rods. Even though the manual indicates the bushing can be removed and replaced from the front, I've always ended-up removing the entire axle and carrier from the front of the tractor and hammer the bushing out from the back side. Depending on what you have for tools, that may be the easiest way to do it. My suggestion is to save yourself some aggravation. If the bushing fails to move on the first try, go ahead and remove the entire axle and carrier, so you can bang on the back-side of the bushing with your biggest Ford tool. I usually caution against using too much force. This is one case where you can bash away with gusto and glee. Look at the top of the spindles in relation to the top of the front axle. When you put a jack under the front end and jack it up the spindles shouldn't drop down as the weight comes off. While you have the weight off the front wheels, check for side play in the spindles and loose wheel bearings. Everything should turn and spin free without being excessively loose. Loose spindles or hubs will bind when you put weight on them and be very difficult to turn. In addition to being hard to turn, the added effort can quickly wear out your steering gear. The general condition of your steering gear can be easily checked without tools. How well does it work? The steering wheel should turn without too much effort in both directions without grinding, binding, or side play. Check for side to side and up-down play in the steering column by trying to moving the steering wheel. If the bearings in the column are bad, they will have to be replaced before attempting to adjust the sectors.